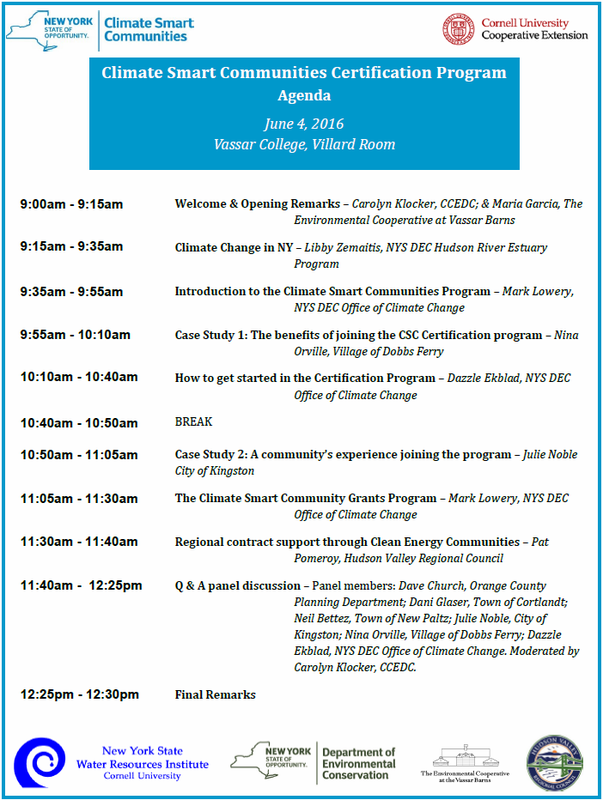 On Saturday, June 4th, 2016 Cornell Cooperative Extension, in partnership with the NYS DEC Hudson River Estuary Program and the NYS DEC Office of Climate Change hosted a forum for Hudson Valley communities on the Climate Smart Communities (CSC) Certification program. The forum provided an overview of the program, the benefits to participating in the program and how to get started. Participants will learned more about how completion of certain CSC Certification actions increases the competitiveness of applications for CSC grants. Presentations also included case studies from communities that are participating in the CSC certification program, Kingston and Dobbs Ferry, as part of their strategy to become more resilient to extreme weather. The program ended with a panel discussion that also included representatives from Orange County and the Town of Cortlandt, who also are certified communities. 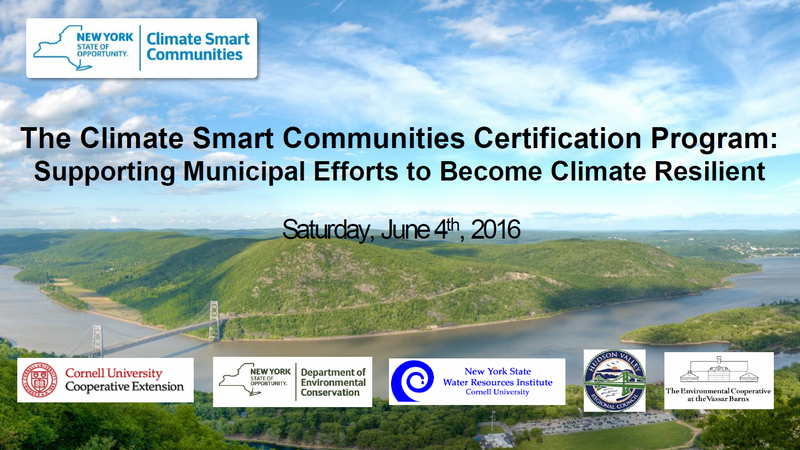 The NYS Climate Smart Communities Program supports municipalities as they plan and carry out climate-friendly actions that match community goals and save taxpayer dollars. Over 170 New York municipalities have made the decision to engage their citizens in energy efficiency, renewable energy and the green economy through the ten program elements in the Climate Smart Communities Pledge. The CSC Certification program provides a framework to guide a communities climate actions while also providing recognition for their leadership. There are over 120 individual actions communities can take to mitigate and adapt to the effects of climate change while also and simultaneously earning points in the program. 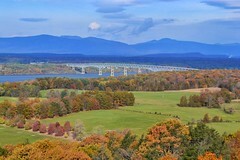 The forum was generously sponsored by the Hudson Valley Regional Council, the Environmental Cooperative at Vassar Barns, and the Hudson Estuary Watershed Resiliency Project.